Other photos supplied by user group members. 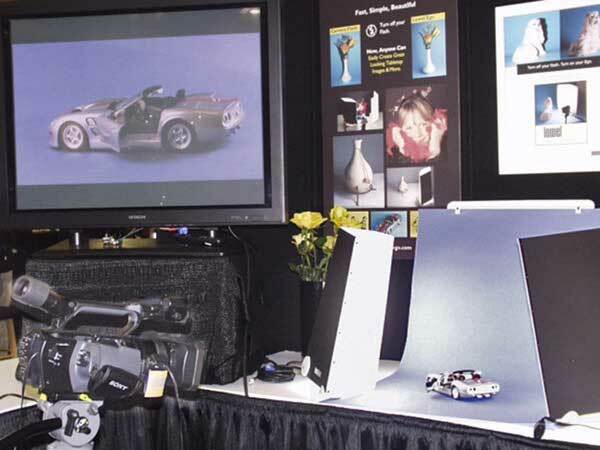 The most important exhibit at MacWorld this year were the attendees, and a newfound enthusiasm for their favorite tool. I am not talking about the iPod, which now needs its own show. I speak of Intel logos dancing through their heads, shiny new products, perky software updates. I saw a happy and attentive crowd, of which I was surely a biased member. As last year, the Expo occupied one hall of Moscone Center, but a glance at the floor map told you it was more packed, and I would not be surprised to see it spill back into the North Hall next year, especially now that MacWorld Boston is sadly gone. Video blogging pioneer Steve Garfield of BOSFCPUG early in line for the Keynote. 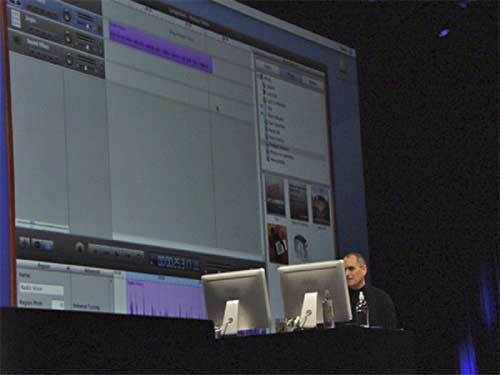 Steve Job's keynote was satisfying, disclosing the new iLife 6 'iApps" suite. GarageBand 3 sports podcasting, and features a volume lowering feature which was named "automatic duck" -- digital editors who use both Avid, FCP and After Effects workflows found that amusing. The feature lets your voiceover automatically ride over background music. Steve demo'd it live, and it was very Apple-cool, based upon applause. Speaking of the "iApps", there's a new one: iWeb, which allows you to rapidly create web pages, blogs, podcasts and Really Simple Syndication (RSS) feeds. That got a nice response at the keynote. Dot-Mac online disk storage/sharing service recently increased storage to 1GB, now with hooks into iWeb for all kinds of digital publishing. At $99.00/year, it's getting to be a more useful buy. Intel CEO Paul Otellini suddenly appeared from hissing white smoke in a clean room bunny suit, clutching the chip biscuit for the newest engine, to pledge allegiance to Our Side. 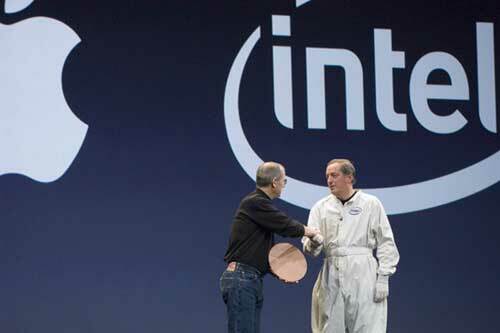 Steve then revealed the first Intel iMac, which had been smoothly running the stage demos all along. 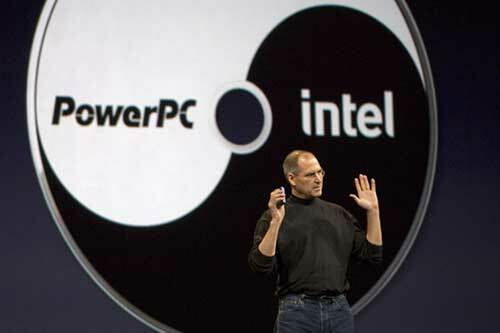 Steve described how the new machines will run both Intel and older PowerPC software in "Rosetta" emulation. All new software releases will be "universal binaries" or optimized for the Intel engine. A slim new 15.4" Macintosh Intel laptop called the er.. MacBook Pro, targeted to prosumers. This model will be offered at 1.67 GHz or 1.83 GHz speeds, contains a 4X SuperDrive (faster wouldn't fit the thinner design), 512 (up to 2GB) RAM, SATA drive, one FireWire 400 port, along with USB 2.0, Bluetooth, Ethernet, and built-in iSight- a first! 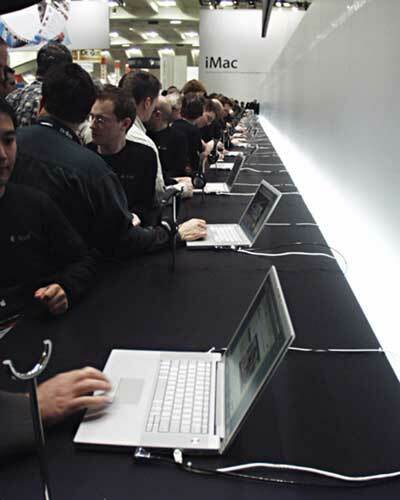 The offering (and the Intel iMac also available for hands-on) seems to have forgotten about the more reliable FireWire 800, but the crowd went fairly wild. The patented "Mag-Safe" AC plug is very useful-- if you trip on the cord the laptop stays where it is. Steve didn't mention it, but Classic mode is dead on Intel machines. It's also an open question as to whether or not you'll be able to install the upcoming Windows "Vista" OS to create a dual-boot machine (you know, for the games). 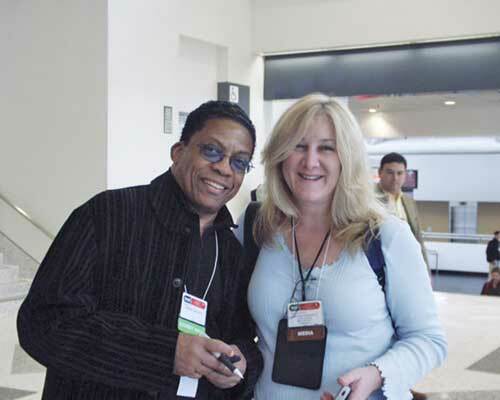 Fresh from the Keynote, the one and only Herbie Hancock, with Deborah Shadowitz, LA-based "MacGathering" coordinator, author, and all round evangelist. You could not get near the new Apple machines for the first two days, the lines were 4-5 deep. But there was plenty else to take up your time. 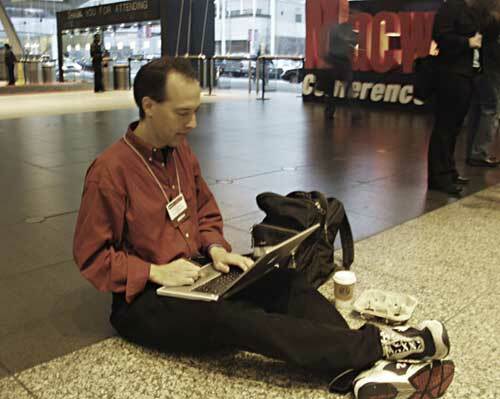 The first thing I checked to make certain I was at MacWorld Expo- yep, there's the Nada Chair. They've been at every MacWorld Expo I can remember. 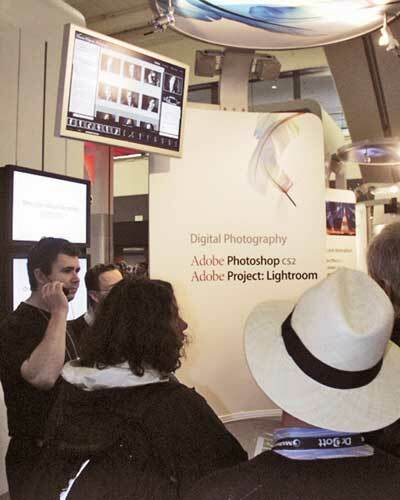 Adobe has returned to the show floor, joining Microsoft, Quark, and other usual suspects. Adobe's newest digital asset manager, LightRoom, competes with Apple's new Aperture product. Mac users now have choices in how they wish to manage, sort, tweak, compare, rotate hundreds of thousands of photos. But even Apple's own iPhoto from its iLife package now handles 250,000 photos! Curiously, After Effects 7 was released after the show closed. For those of us in motion media design, it's major. A sharply redesigned interface, friendly new timeline Graph Editor, the new app's Pro Bundle now supports, HDV import, and 32-bit HDR (High Dynamic Range) imaging, without a plug-in-- its capabilities are amazing. Canon and Nikon were well placed on the floor. 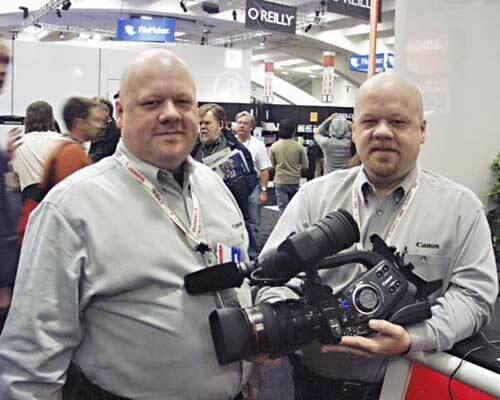 Canon has introduced its first HDV camera, the XL H1, here proudly held by BOSFCPUG chair Dan Berube and his twin brother Don-both are Canon reps. The new camera records 60i, 30F and 24F, supporting HDSDI output, with a bevy of pro features. 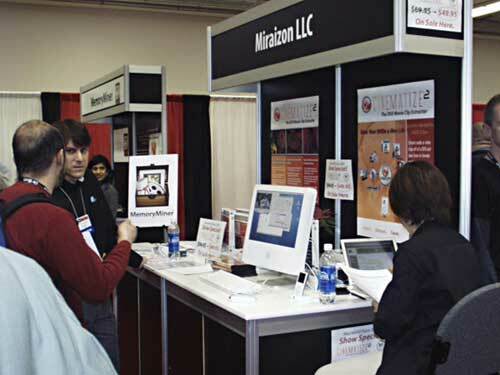 Mini-training sessions were a feature of Peachpit, Adobe, FileMaker and Microsoft and other pavilions. 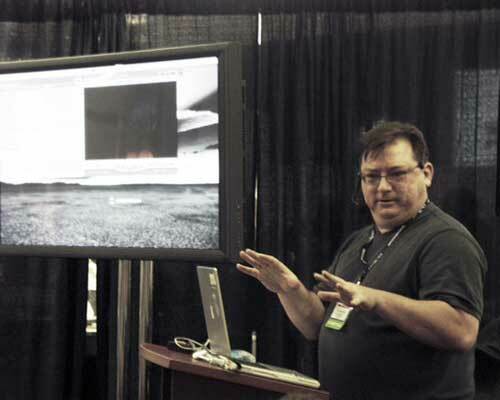 Here, Peachpit author Kevin "Telly" Monahan (who founded SF Cutters, the first FCP user group) gave some great tutorials on using the built-in FCP effects tools. 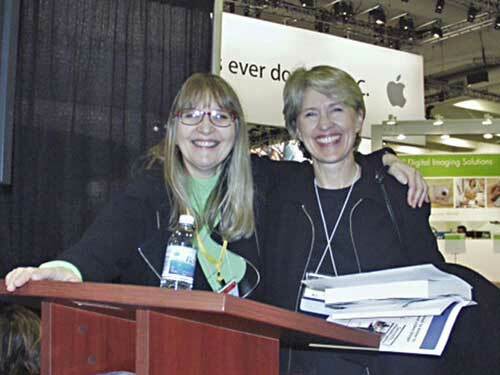 Apple Pro Apps training guru Diana Weynand (right, with business partner Shirley Craig) delivered tours of Final Cut Pro 5. Josh Mellicker offered some Pro-Apps show-me work, as did Editor/Instructor Larry Jordan. Steve Martin conducted Final Cut Pro Power Tools sessions, which as always were held in quiet off-floor classrooms. 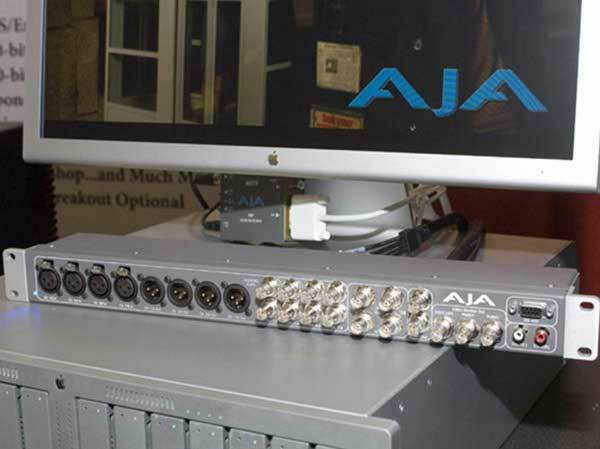 AJA chose MacWorld Expo to introduce the Kona 3 HD PCI-Express card (US $2999.00) and optional K3 breakout box ($299.00). The Kona 3 is the first in the line with a live hardware keyer, supports 12-bit and 10-bit HD and SD, 8-channel 24-but AES and SDI embedded audio, RS422 machine control. It supports 4:4:4: colorspace; it captures, plays back, up-and-down-converts all HD and SD flavorsjust everything you'll need for the rest of the decade. 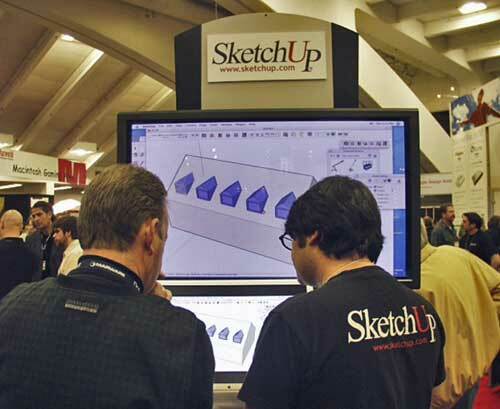 The revolutionary 3D drawing application SketchUp had a solid presence. It's now used in film production for 3D scene setup previz and walkthroughs, and at version 5, it sports a huge library of real-world film and video equipment components which are easily placed and manipulated. 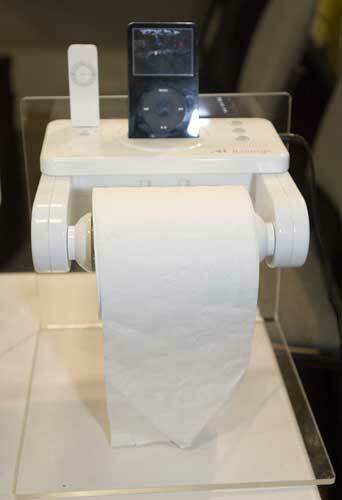 This is an extremely Apple-cool product utilizing a patented easy-drawing 3D system and it is maturing nicely. The show floor contained a larger Special Interest forest of kiosks, with new players such as Miraizon LLC's Cinematize, which allows outrageously easy DVD segment ripping, and the return of older players with new acts-- like Equilibrium famous for its DeBabelizer document and image conversion software, now at version 6 and also available as part of Equilibrium's new patented high-end image server/batch processing solution, which looked comprehensive and fearsome in capability for publishing houses. A personal favorite, the veteran auto-expansion utility TypeIt4Me by Riccardo Ettore, was showing the newest OSX version, and a new exhibitor, Memory Miner, a family-history media scrapbooking and connections utility, stole the show prize for originality. Another legendary favorite, QuicKeys, showed the newest version of its full-featured macro-making utility which saves tons of typing and repetitive tasks, and Trans Lucy, a utility which allows you to watch a DVD through a transparent window, even over another application like Word. Digital asset management and remote web review are features offered by SeeFile, a startup which already has fans. 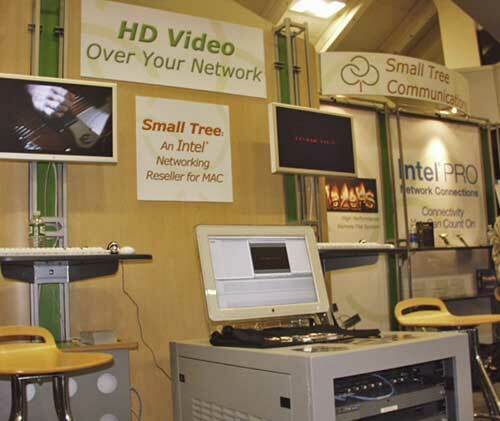 HD networking over 10GB copper Ethernet PCI-X cards comes from Small Tree Communications. Small Tree became known for its Xserve work at the University of Virginia G4 Supercluster. 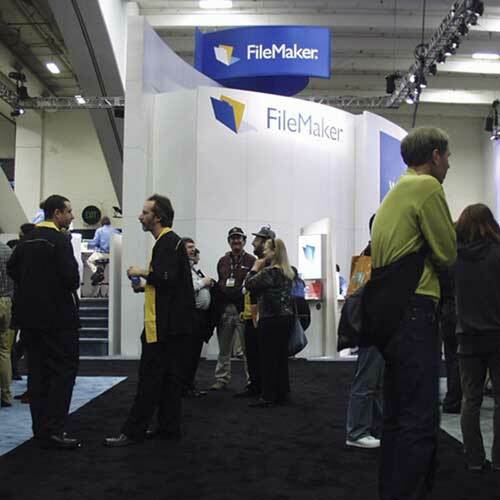 FileMaker had a great forest of solutions kiosks, including the up and coming Beezwax with its new "Inspector" utility-- which removes drudgery of debugging FileMaker field formulas and scripts. FileMaker itself has a filmmaking context. Editor Walter Murch showed up at their pavilion with his associate Sean Cullen to reveal how they build the entire production master log codebook in the app, with relational lookups and a very heavy list of custom scripts to derive reports on everything from total running time (using a formula Walter worked out as the cut proceeds) to total footage shot. Walter has been a Mac user since 1986 and a FileMaker user since the beginning. Hopefully they'll polish it and offer it as a product. Walter is also a beekeeper. I had a nice conversation with him at the booth about his discovery that bees can't find their hive if it's moved only two yards -- we agreed audiences can be like that when watching a movie. 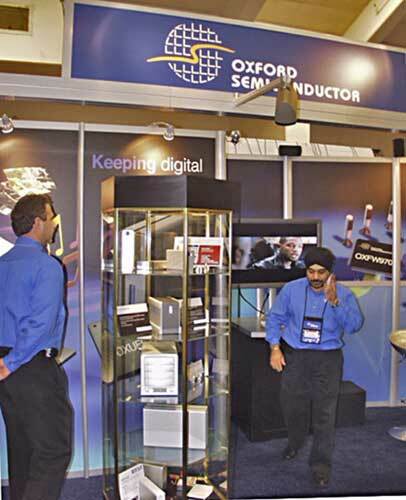 You might not expect original equipment hardware vendors like Oxford Semiconductor to appear on the show floor, so naturally, there they were, as they were last year, proud to show the many FireWire devices using their bridge chipsets. They also sported a new 5.1 surround card solution from ordinary stereo feed which sounded very cool. Drive manufacturers such as Huge, G-Tech, LaCie and WeibeTech were also on the floor, showing SATA storage, with many RAID solutions. Gefen was on hand with every possible display connector and adapter you could possibly need, such as from VGA-to-ADC and probably DVI to tree bark to tap maple syrup-you name it, they have it, including home theater connection products. This was also an auto show. Several cars were tricked out with a variety of iPod playback solutions. 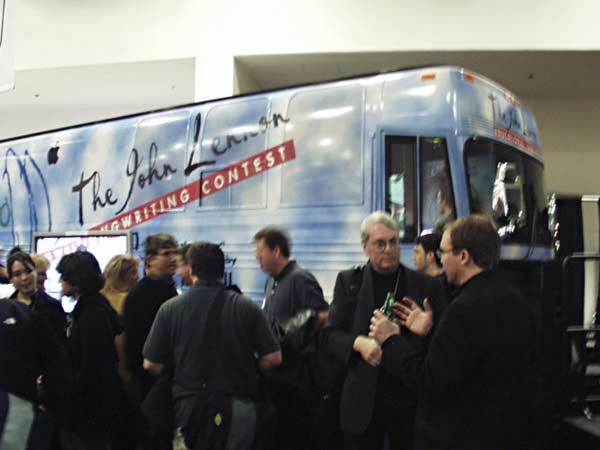 And dominating one corner of the hall was the John Lennon Tour Bus, a vision of musician Brian Rothschild, supported by Yoko Ono, Apple, and other vendors, which promotes music production skills and competitions for inner city kids. The bus is amazing, it has a ProTools station, a Final Cut Pro station, viewing area, etc. Your music video magic bus. They hosted a very nice after-show gathering which included Herbie Hancock and Al Jarreau among the munchees. Music was a major player this year. 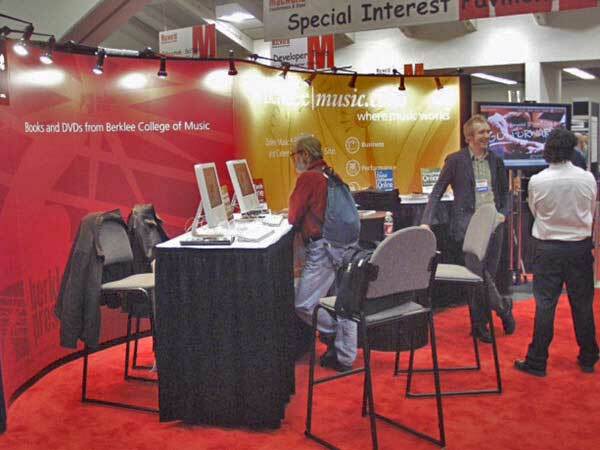 Berklee College of Music out of Boston had a floor booth, a Dream Studio pavilion exhibiting state of the art music hardware and software systems and real pro's demonstrating on stage; and David Mash, Berklee's "Vice President for Change" conducting Power Tools sessions in Logic 7. Lighting giant Lowel showed its very portable and ingenious Ego softlighting sytem for tabletop photography. 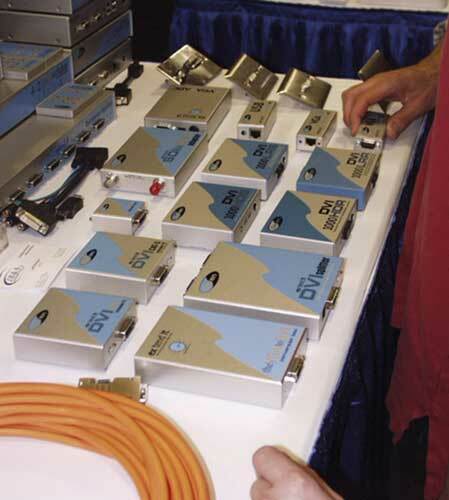 From the sublime to the goofy-remember, "iPod" spelled backwards is "Dopi"-- the show floor had it all. LAFCPUG/BOSFCPUG member Loren S. Miller is an award winning editor, filmmaker, digital media writer, and KeyGuide developer. Reach him anytime at lormiller@mindspring.com and buy his KeyGuides at www.neotrondesign.com.